Canon has unveiled three new all-in-one inkjet photo printers, the Pixma MG7520, the Pixma MG6620 and the Pixma MG5620, new to its line of cloud-connected printers. All three models are compatible with the company's Pixma Printing Solutions (PPS) printing and editing app and the Canon Easy-PhotoPrint+ Web app for cloud printing and photo editing. PPS allows users to "print and scan images and documents from several of the most popular online social platforms and services, such as Facebook, Twitter, Flickr, Photobucket, Dropbox, Evernote, Creative Park and Creative Park Premium along with the newly supported Google Drive and Microsoft OneDrive," according to a news release. Easy-PhotoPrint allows users to access and edit photos from a local drive or social platform and finish a project on a different device than it was started on. 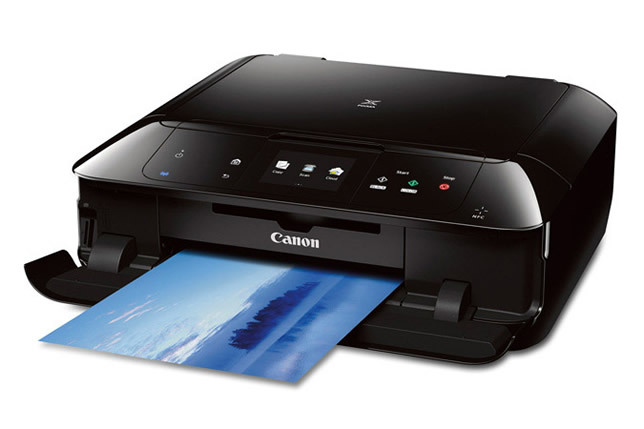 "Helping the end user increase their productivity through wireless capabilities, other key functions of the new printers include the updated PIXMA Cloud Link, for sharing scanned documents and photos easily by scanning data directly to email, or attaching scanned data to a draft email in their webmail account," according to information released by Canon. "Additionally, PictBridge (Wireless LAN) functionality allows select Canon digital cameras to connect directly to the printer ­— eliminating the need of a computer. With Access Point Mode, users can also connect their compatible mobile device to their PIXMA printers directly through Wi-Fi without needing to be connected to a router." "With the introduction of these three PIXMA printers, Canon aims to provide high-quality output and cloud-connectivity features that are important for the day-to-day convenience of our customers," said Yuichi Ishizuka, president and COO, Canon U.S.A., in a prepared statement.